It’s a small detail of great consequence. 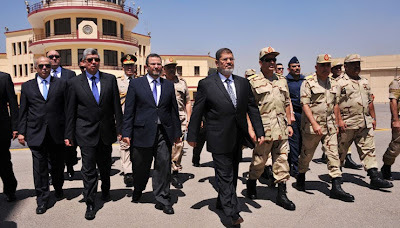 On July 3, members of the presidential guard stepped away and let Dr. Mohamed Morsi and his aides be arrested by army commandos. If men with guns and tanks can simply arrest an elected president, then what’s to keep them from doing it again and again? The horrible precedent this sets is buried under the partisan fury for and against the Muslim Brothers. Haters of the MB apparently see nothing wrong with the military summarily detaining the first elected national leader in Egyptian history. Boosters of the MB are so caught up in their own injury that they’re not pausing to wonder why a great many people feel relief and even satisfaction at the demise of the Morsi presidency. I don’t want to belabor here the polarization that so many others have written about. I want to reflect on what Dr. Morsi did to hasten his ignominious ouster. As a seasoned politician with long experience dealing with the Mubarak state, surely Mohamed Morsi and his inner circle realized the unbelievable obstacles they were up against. Dangers lurked everywhere—resistance and intrigue from the mukhabarat state; corruption and obstruction from top to bottom of the bureaucracy; a rogue police force intent on facilitating rather than containing violence; fulul networks in every province ever-ready to block any change; a hostile media establishment hellbent on demonizing the MB; and considerable public mistrust of the Brothers well before Morsi set foot in the presidential palace. Stubbornness, stupidity, incompetence, myopia, dictatorial intent – all have been breezily thrown about in an ugly carnival of Morsi-blame and schadenfreude that may emotionally satisfy some people. But it doesn’t begin to get at a real understanding of the perils of governance in a revolutionary situation. Dr. Morsi’s challenges and failings are sure to re-appear in future presidents. That’s assuming we’ll get future presidents who come to power through credible elections, not stage-managed pageants. Here I want to flesh out a remark I made about Mohamed Morsi when he was first elected. I want to argue that Dr. Morsi’s core mistake is that he underestimated and neglected the very public that his enemies were cynically and ceaselessly courting. He and his advisers chose to govern behind closed doors, without first girding themselves in protective public support. When the problems piled up and the mukhabarat state tightened the noose, Morsi found no succor from anyone outside his trust network. This isn’t an issue of the former president’s stubbornness or blindness or whatever. It’s his embodiment of a mode of leadership that’s common in the world of politics but very inadequate for the treacherous terrain of post-revolutionary politics. Dr. Morsi’s fatal weakness is that he’s a prototypical party oligarch, and this made him distinctly unsuited for the extraordinary responsibility he took on. The Muslim Brothers have always been an essentially middling movement, not in the sense of ‘mediocre’ but in the sense of straddling two worlds. Their base is rooted in the middle and lower classes, with a real interest in transformative socio-economic change. But their leadership has always had its eye on joining,not destroying, the system. Over the years, the MB leadership crystallized into a counter-elite of well-to-do, urban, upwardly-mobile professionals and businessmen eager to enter the exclusive ranks of the establishment. The Brothers are still second to none in their public outreach during elections, knowing how to woo rather than spurn ordinary citizens. But as with all large organizations, the leadership has developed interests of its own, principally self-preservation. The leaders’ hold over the organization is reinforced by decades of state repression and the kind of insular decision-making that it breeds. Such an environment encourages a conception of politics as the art of machination and intrigue, of deal-making behind closed doors with both allies and adversaries. The contrasting conception of politics as the painstaking, transparent, messy work of coalition-building between large, cacophonous groups has less purchase. Why invest time in cultivating horizontal ties with other groups when there are greater (and quicker) payoffs from bargaining with those at the top? The MB’s now-notorious practitioner of politics-as-elite-intrigue is financier and strategist Khairat El-Shater, invariably referred to as the group’s “strongman.” Shater is emblematic of the rising Islamist counter-elite aspiring for a share of national power, only to be rebuffed every time by the Mubarakist entrenched elite. After being blocked from an academic appointment in 1981, Shater turned to the family business and became a millionaire, in spite of the Mubarak regime’s repeated crackdown on his businesses, starting with the 1992 shutdown of his computer company (Salsabeel) that he co-owned with businessman Hasan Malek. Incidentally, the prosecutor on that case was none other than Abdel Meguid Mahmoud. 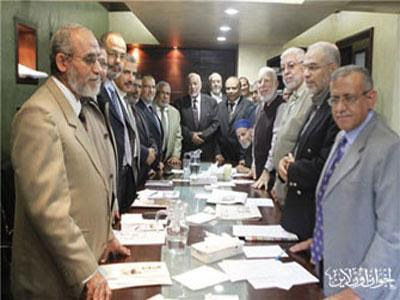 Beginning in 2004, Shater’s star began to rise in the MB and was cemented with the January 2010 internal elections that put Mohamed Badie at the helm and re-arranged the politburo to push out Shater’s rivals, Abdel Moneim Aboul Fotouh and Mohamed Habib. The first handicap that afflicted Morsi’s presidency is that he is a Shater loyalist, which is not the same as being the best man the MB could put forward for such a critical position. Morsi as stand-in for Shater may have been passable to the party faithful, but not to Egyptians at large. It left an undying impression among both the general public and Morsi’s opponents that he was the wrong man in the wrong place. And this is before he made a single executive decision. Morsi’s personal attributes reinforced the image of an unconvincing president. The whip of the Ikhwan’s bloc in the 2000 parliament, he was the quintessential party manager. His manner was rote, risk-averse, a tad pallid. He didn’t do outreach, like MB leaders Mohamed El-Beltagui and Helmi al-Gazzar, both comfortable around and popular with non-Ikhwan politicians and the media. Morsi’s natural habitat is the executive committee meeting of the party, flanked by fellow party elders and deferential to the towering figure of Shater. Typical of party leaders, the MB and Morsi did court non-MB voters, but purely for electoral purposes. 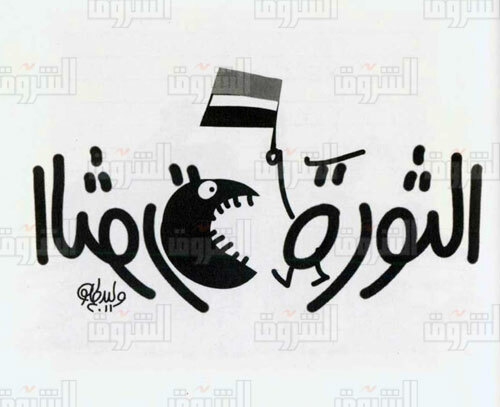 They changed their campaign slogan for the second round of elections to the glib “Our Power is in Our Unity.” And the Morsi campaign courted a group of activist luminaries who pledged to support Morsi over Ahmed Shafiq at the famous “Fairmont Meeting.” In return, the group asked for an inclusive national unity government and presidential advisers from outside the Ikhwan. Morsi balked at the former and acceded to the latter, but after the November 21 decrees, all of his advisers resigned, refusing to serve as ornaments in an essentially Ikhwan presidential administration. Morsi began his short-lived tenure in office with a lot of baggage. He didn’t ride into the presidency on a wave of popular enthusiasm, as one would expect of the first ever free presidential elections after a heroic popular uprising. Aside from the brief, celebratory day of June 29, 2012 when Morsi took his oath in Tahrir Square, the general mood was sober. Shafiq had secured a stunning 48% of the vote, a clear sign that the forces of the old order succeeded in molding a sizeable public opinion against change. And the Muslim Brothers’ subpar performance in parliament and their hogging of the constituent assembly throughout the spring of 2012 left an indelible feeling that they wanted to “take over” the whole state. Morsi’s enemies in the deep state started working on the public from day one. Ironically, they read the election returns better than the Brothers did, recognizing in major metropolitan centers a significant anti-Ikhwan sentiment that they worked to stoke. Within a week of Morsi taking office, they had their chance. On July 8, Morsi issued his first decree re-seating the parliament dissolved by SCAF based on a Supreme Court ruling. The civilian president looked like he was intent on using his executive powers, not merely being a figurehead. Alarm bells went off in the military and intelligence apparatus. The ever-useful Mohamed Abu Hamed called on the military to act against the president. 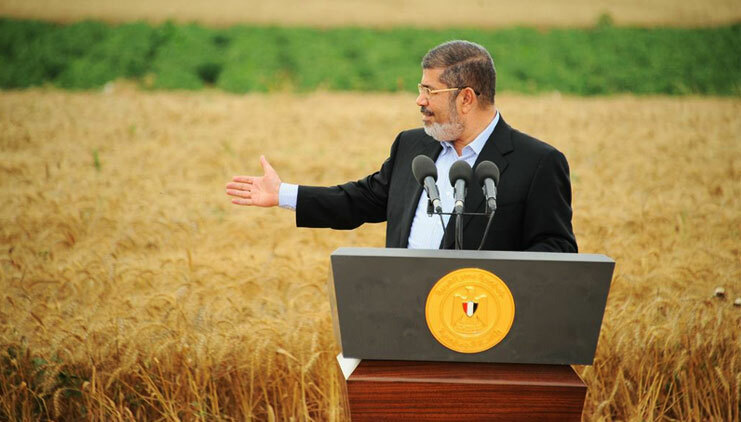 Thus began the campaign to cast Mohamed Morsi as the MB’s cat’s paw to take over the state. Significantly, the military’s propaganda video justifying its coup cites the July 8 decree as the beginning of Morsi’s supposedly irresponsible actions that precipitated his own downfall. But let’s not be lulled into parroting the military’s storyline. The generals’ goal is to demonize any effort to create an independent power base within the Egyptian state, especially if that power inheres in an elected institution. So they use the discourse of failure, autocratic usurpation, and incompetence to smear Morsi and reinforce their exclusive hold on power. We have to come up with our own independent assessment of Morsi’s performance. Morsi’s performance oscillated between acting with resolve to push back against obstruction and going slow so as not to antagonize powerful entrenched fiefdoms. 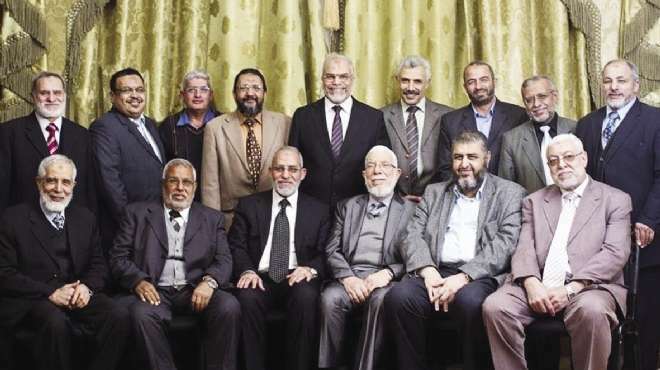 Morsi used the first strategy against the Mubarakist judiciary, thus transferring to the presidency the Muslim Brothers’ intensifying conflict with the courts that they had started while in parliament. The November 21 decrees are the case in point here. Morsi tried to protect the constituent assembly and Shura Council from judicial dissolution, but did so by touching a nerve with Egyptians: increasing presidential powers. The second strategy of placation was used with the police. As an outsider president, Morsi’s dilemma was that if he moved to purge the police, he would face a mutiny that would bring down his rule. If he chose accommodation, he would be held accountable for the continuing torture and abuses of a rogue police force intent only on maintaining its untouchable status. 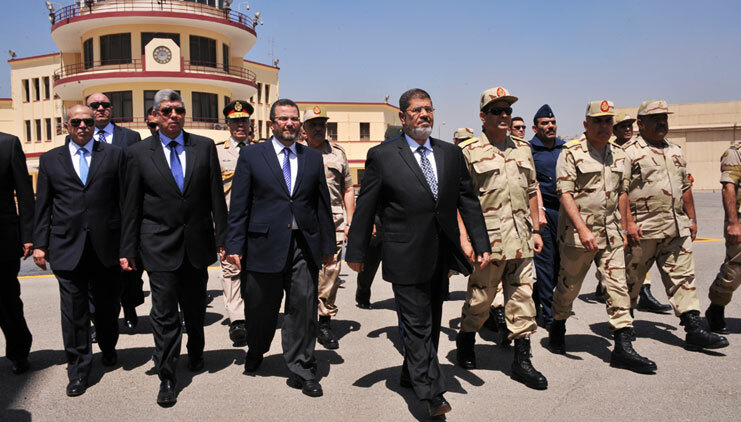 Morsi repeatedly accommodated the police, only to get the worst of all worlds. Citizens were outragedby continued police impunity, while police strikes and passive resistance intensified the collective violence and chaos that destabilized Morsi’s rule. In ordinary times and places, a dual strategy of confrontation and appeasement is the stuff of presidential politics. In the power struggle of post-revolutionary Egypt, presidential politics is an existential gamble. Morsi became trapped in a cycle where he was accused of dictatorship if he moved aggressively and accused of betrayal if he pursued accommodation. The wider public tuned out this grand drama, seeing no stake in the epic battles playing out at the top. Morsi’s sense of besiegement and retreat into his Ikhwan trust network was a huge disincentive for the public to even try and sympathize with the embattled president. Most Egyptians could be forgiven for feeling that the whole thing didn’t concern them, that it was just a new round of the perennial conflict between the Muslim Brothers and the state. It wasn’t a battle between the first elected president and the corrupt deep state, but a fight between the president of the Muslim Brothers and his group and everyone else. The anti-Morsi media drove home this framing every day and night. If an alien had parachuted into Egypt in spring 2013 and turned on the television, the impression he’d get is that the state had been hijacked by a lunatic tribe that was running the country into the ground. The insular, preaching-to-the-converted media of the Muslim Brothers stood no chance against this juggernaut. The best that can be said about the president’s attempts to reach out to the public at this juncture is that they were perfunctory. His speeches were bland status updates, boring balance sheets of what the government had achieved and still needed to do. As crises mounted, the underworld of deep conflict between the president and the security services began to bubble up, but in a way that made the president appear even weaker. Had Morsi pursued a different tack and built a robust popular front to help him take on the Mubarakist ruling caste, would he still be president today? I don’t know. My argument suggests that even if he wanted to, Morsi wouldn’t have been able to build firm bridges. He was too imprisoned by the MB leadership’s strategic decision to go it alone. For them, ‘real’ politics is the interaction between competing elites. The politics of coalition-building and public persuasion is small potatoes compared to the high politics of elite machination. Tragically, this age-old conception of power cost them a lot more than their short-lived exercise of power. For me, there’s nothing to celebrate in the rout of the Muslim Brothers. Warts and all, they were the only civilian counterweight to absolute military supremacy, the only organization big enough to stand up to the self-preserving generals and their partners in the civilian bureaucracy. But their leaders’ strategies led to their undoing by the far more powerful, vicious ruling caste. The consequences of their defeat go far beyond simply injury to their organization. The downfall of the Morsi presidency will also be cast as the futility of the hope that outsiders can govern. The Brothers proved to be excellent tools in the counter-revolution’s master operation of regaining exclusive control over the state. The Morsi episode is already being framed as a cautionary tale of the bad things that happen when unqualified outsiders dare to enter the hallowed precincts of state power. Millions entrusted Dr. Morsi with making the state work for its people, of ending decades upon miserable decades of state theft, violence, and neglect. He did not, could not, fulfill the trust. If the largest, best organized, and most politically experienced mass movement can be so handily slain by the forces of the old order, what hope is there for the weaker segments of the opposition, many of whom have already proved their willingness to pact with the dominant elite out of hatred for the Islamist counter-elite? In my political dream world, this defeat will catalyze an internal revolution in the Muslim Brothers and the rise of a new leadership more committed to far-reaching change, and skilled in the politics of coalition-building. A historic entente will ensue between the new and improved MB and new and improved factions of the secular opposition, who will have learned their own hard lesson to never, ever trust the military, and to respect ordinary citizens more. This powerful alliance will contest and win parliamentary and presidential elections, firing up public enthusiasm for a decisive showdown with the old order and its foreign backers. 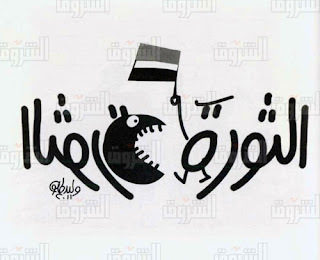 Would that the next round of the Egyptian revolution follow my playbook. For there will be a next round, but nobody knows whose playbook it’ll come from.